There are technologies that have been looked into that could be used to bring the salmon back. 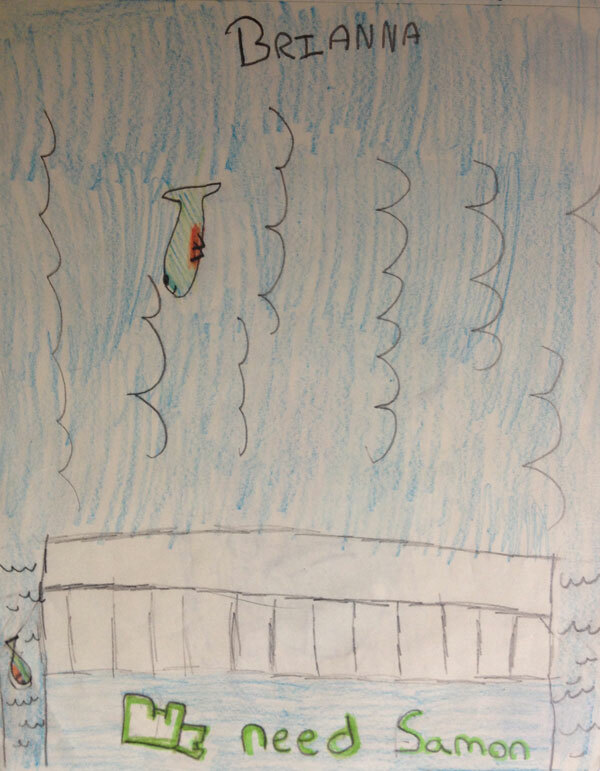 We can use the fish ladders, fish elevators, or salmon cannons (WHOOSH technology). It's not hopeless. These are possibilities for the salmon's future. 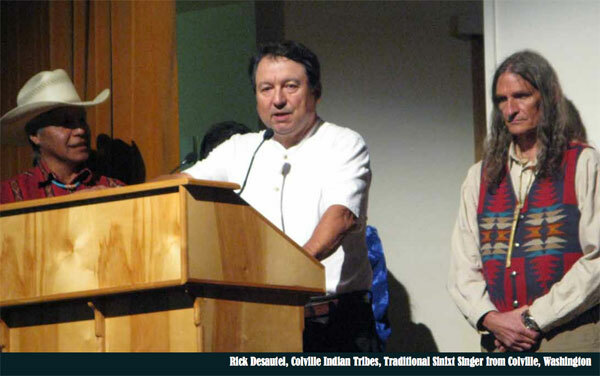 Convergence for a Pipeline and Tanker Free BC,held June 2nd, at the Brilliant Cultural Center in Castlegar was a successful merging of groups, cultures and nations on behalf of important issues which concern people, our province and our planet. 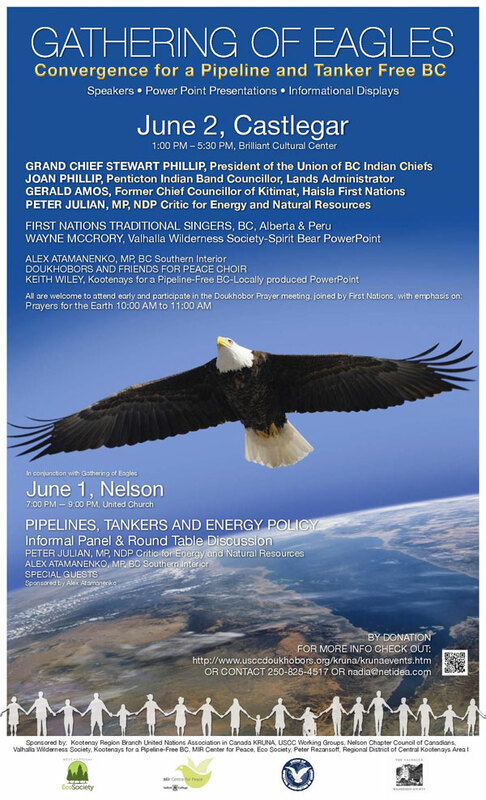 Despite the provincial governments’ recent announcement that they were rejecting the proposed Enbridge Northern Gateway Pipeline to Kitimat, approximately 400Kootenay residents and guests still turned up to the event, and over 150 people arrived early, to participate in theDoukhobor prayer meeting, whichemphased prayers for the Earth, led by Ernie Verigin. 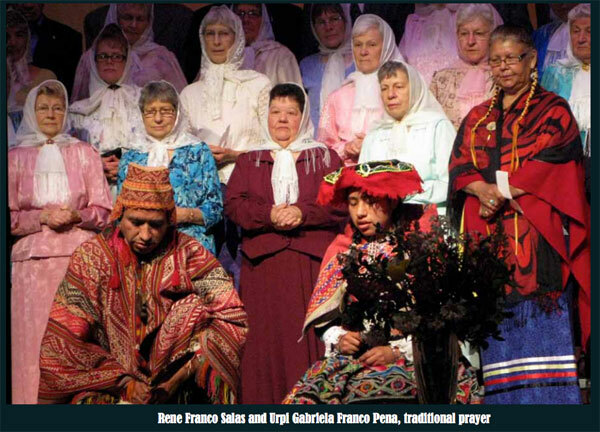 The main event commenced at 1:00pm with unifying traditional First Nations prayers and songs by First Nations people from Washington, BC and Peru followed by uplifting hymns by the Doukhobours and Friends for Peace Choir. 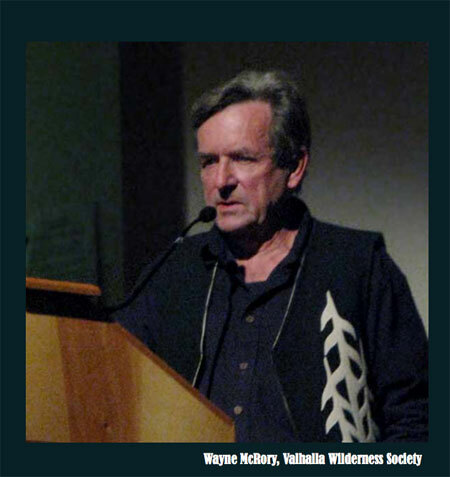 Bear biologist Wayne McCrory of the Valhalla Wilderness Society led with a powerful visual presentation on the devastation to the boreal forest from tar sands production. Based on his recent studies, McCrory revealed how an imminent bitumen tanker spill would wipe out the rare genetic population of spirit bears along the tanker route on Gribbell Island. McCrory pointed out that this would only be one of many devastating impacts to the vast coastal ecosystem. “The ink was hardly dry on the government’s and First Nations agreement to protect 1/3 of the Great Bear Rainforest when along comes the biggest threat ever, the Enbridge Pipeline” said McCrory. He affirmed what he learned from the 1989 Exxon Valdez spill, including the myths being perpetrated by industry and government, which incorrectly declare oil spills on the coast, can be cleaned up. “The bitumen will be there on the beaches and sea bottom for centuries. It can never be cleaned up,” said McCrory. 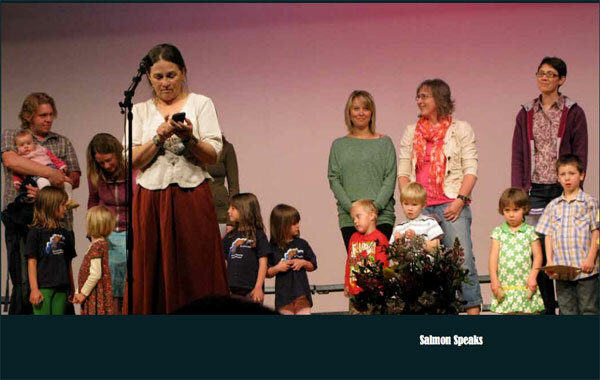 Other presenters included “Salmon Speaks” a twinkling bouquet of innocent children from the Slocan Valley who sang out their hopes for clean healthy rivers and for the salmon to return. 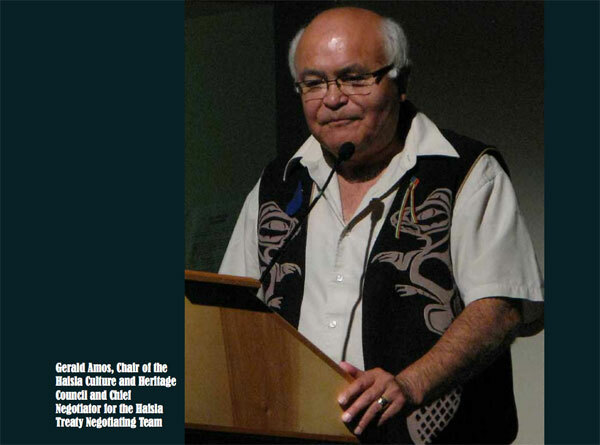 Gerald Amos, former Chief Councillor of the Haisla First Nations of Kitimat, also expressed his deep concerns of pipelines and tankers threatening the traditional livelihood of his people, who still rely on the sea for much of their sustaining foods. He invited people to join them to stand in front of the bulldozers should the project be approved. 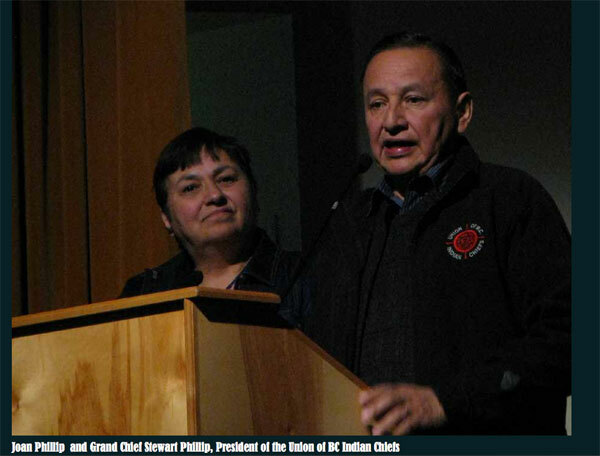 He stated it would not be civil disobedience because the Coastal First Nations made a Declaration saying No to Tankers, and a blockade would be in obedience to his peoples’ declaration. "Salmon Speaks" visited some schools: (Slocan, Winlaw, Salmo & Castlegar). The children responded with empathy, anger and problem-solving. 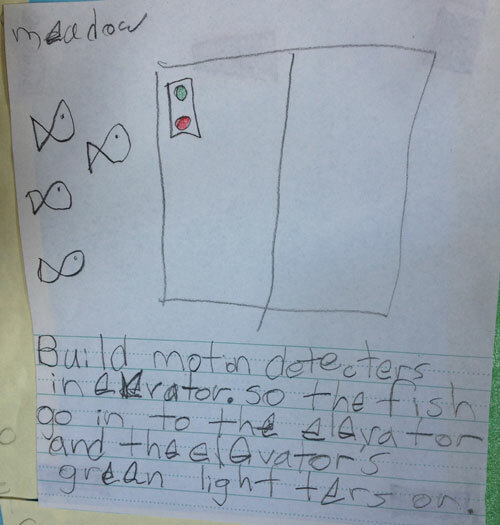 "Build motion detectors in elevator so the fish go into the elevator and the elevator's green light turns on." 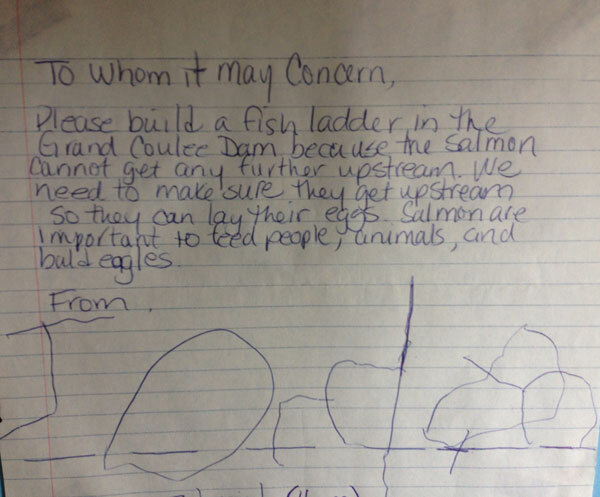 "To Whom It May Concern: Please build a fish ladder in the Grand Coulee Dam because the salmon cannot get any further upstream. We need to make sure they get upstream so they can lay their eggs. Salmon are important to feed people, animals, and bald eagles.